Our Founder - Editor : Shri Babubhai A. Soni was born on 21st October, 1918 at Ahmeadabad. He took his education at Ahmedabad. He passed his Matriculation Examination of Bombay University in the year 1934. He obtained his degree of Bachelor of Arts with Honours in Sanskrit in the year 1938. He studied law from Sir L. A. Shah Law College, Ahmedabad and took his LL.B. Degree in the year 1940. After obtaining the necessary Sanad he practiced in various Courts in Ahmedabad. In the era of Independence movement, he helped many freedom-fighters. He joined the Editorial department of well-known Gujarati Daily Newspaper "Sandesh" in the year 1944. He with other colleagues revived the Gujarat Working Journalist Union and became its first President. He was also a member of Press Accredition Committee appointed by the Government of Gujarat and remained there about two years. He pleaded the cases of mofussil journalists. He has also represented case of journalists before the Working Journalist Wage Board at Ahmedabad as well as at Pune in the year. In the year 1960, on the establishment of the Gujarat High Court he started publication of Gujarat Law Reporter as the Editor and continued there until he breathed his last. Prior thereto, he had written various law books in Gujarati such as "Bombay Village Panchayat Act", "Bombay Tenancy & Agricultural Lands Act", "Factories Act", "Bombay Shops & Establishment Act", "Employees' State Insurance Act", etc. which were published almost every year with revised editions. He was also a good Bridge player and receipent valuable prizes in club competition. He was amiable in nature and helpful to others. In our pursuit to enhance the legal profession, we have come a long way since 1960. Although, the beginning was only by the way of spreading information through the print media. It was the esthetics of the profession which demanded only printed form of information for the purpose of the legal profession. 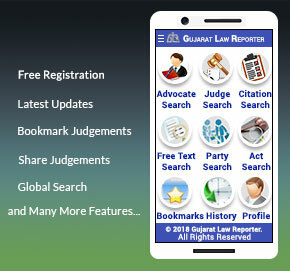 The erstwhile years, almost till date, saw traditionally prevalent form of information obtained from the Gujarat High Court being printed in the form of the monthly magazine - "Gujarat Law Reporter". The short notes provided by us, since the inception, have been a useful tool, for which, the proof is the sustained importance that you as a legal community have been providing us. Thanks a lot for that. The year 1998 saw a sea-change in the way of looking at the profession. It was the short notes that played the most important part in the life of a professional. This gave birth to the novel concept of the "Gujarat Law Reporter Digest". We made our sincere and dedicated efforts to bring forth all the reported judgments to you by way of these 7 volumes. In 1999, we added 2 more feathers in our cap, brought forth more volumes in the remaining years. This is mainly with to the mammoth response shown by you for all these years and in course with the advent of computerisation. Come 1999-2000, and a more efficient idea hit the profession. This idea, of being OnLine, makes the professionals efficient by way of actual application in the field of Information Technology (IT). Not just the publishing, but also the search options and actual data are now easily accessible through the desktop. Gone are the days, where one was required to host a library of law books, publications, journals etal, for his/her legal needs. This effort of ours, backed by your support is going to form the beginning of the "Information Age". So what you now have is the same quality of short notes at your finger-tips within seconds. Get ready for the New Age, that sees a promising future for this profession.